Homer is a city located in Kenai Peninsula Borough in the U.S. Visiting Bishop's Beach Park and Homer Spit will get you outdoors. Head to Norman Lowell Studio & Gallery and Ptarmigan Artsfor plenty of shopping. There's lots more to do: see the interesting displays at Pratt Museum, add some adventure to your tour with a kayaking and canoeing tour, get engrossed in the history at Center for Alaskan Coastal Studies, and hit the best photo ops around with an inspiring photography tour. To see other places to visit, more things to do, and more tourist information, use the Homer online tour itinerary planner . Abu Dhabi, United Arab Emirates to Homer is an approximately 27-hour flight. The time zone difference when traveling from Abu Dhabi to Homer is minus 13 hours. Expect cooler temperatures when traveling from Abu Dhabi in July; daily highs in Homer reach 20°C and lows reach 12°C. Finish up your sightseeing early on the 19th (Fri) so you can travel to Kailua-Kona. Eschew the tourist crowds and head to Greenwell Farms and Jagger Museum. Visiting Manini'owali Beach (Kua Bay) and Rainbow Falls will get you outdoors. Explore the numerous day-trip ideas around Kailua-Kona: Akaka Falls State Park (in Hilo), 2400 Fahrenheit Art Glass (in Volcano) and Hapuna Beach State Recreation Area (in Puako). There's still lots to do: experience rural life at Hula Daddy Kona Coffee, get up close to creatures of the deep with a dolphin and whale watching tour, identify plant and animal life at Kanaloa Octopus Farm, and see some colorful creatures with a scuba or snorkeling tour. To find other places to visit, traveler tips, where to stay, and more tourist information, go to the Kailua-Kona online journey maker . Traveling by flight from Homer to Kailua-Kona takes 9.5 hours. Alternatively, you can do a combination of bus, taxi, and flight; or do a combination of bus and flight. Due to the time zone difference, you'll gain 1 hour traveling from Homer to Kailua-Kona. In July, Kailua-Kona is warmer than Homer - with highs of 35°C and lows of 28°C. Cap off your sightseeing on the 23rd (Tue) early enough to travel to Lahaina. Step off the beaten path and head to Kahekili Beach Park and Kalepolepo Beach Park. Do some cultural sightseeing at Maui On Metal and Kai Pua Artist Studio. Explore the numerous day-trip ideas around Lahaina: Kihei (Scuba & Snorkeling & Stand-Up Paddleboarding) and Haleakala Crater (in Haleakala National Park). And it doesn't end there: stroll through Napili Beach, take a stroll through Lahaina Front Street, don't miss a visit to Lahaina Banyan Court, and kick your exploration up a notch at some of the top local zipline courses and adventure parks. For traveler tips, other places to visit, reviews, and other tourist information, refer to the Lahaina road trip planner. Traveling by flight from Kailua-Kona to Lahaina takes 4 hours. Alternatively, you can do a combination of flight and bus; or do a combination of bus, taxi, and flight. In July, daily temperatures in Lahaina can reach 35°C, while at night they dip to 26°C. Finish your sightseeing early on the 28th (Sun) to allow enough time to travel to Jackson Hole. Discover out-of-the-way places like Oxbow Bend and Teton Raptor Center. Satisfy your inner culture vulture at National Museum of Wildlife Art and Yellowstone Historic Center. When in Jackson Hole, make a side trip to see Grizzly and Wolf Discovery Center in West Yellowstone, approximately 2 hours away. Spend the 29th (Mon) surrounded by wildlife at Grand Teton. There's still lots to do: look for all kinds of wild species at Laurance Rockefeller Preserve, shop like a local with The Brookover Gallery, admire the verdant scenery at Amphitheater Lake, and stroll through Cascade Canyon Trail. To see maps, photos, traveler tips, and more tourist information, read Jackson Hole trip itinerary website . You can do a combination of bus, flight, and taxi from Lahaina to Jackson Hole in 12.5 hours. You'll lose 3 hours traveling from Lahaina to Jackson Hole due to the time zone difference. When traveling from Lahaina in July, plan for a bit cooler days and cooler nights in Jackson Hole: temperatures range from 30°C by day to 7°C at night. Finish up your sightseeing early on the 2nd (Fri) so you can go by car to Yellowstone National Park. Take a break from the city and head to River Rafting & Tubing and Gibbon Falls. Discover out-of-the-way places like Artist Point and Upper Geyser Basin. Take a break from Yellowstone National Park with a short trip to Horseback Riding Tours in Gardiner, about 1h 15 min away. The adventure continues: hike along North Rim Trail, look for all kinds of wild species at Lehardy's Rapids, take a memorable drive along Lamar Valley, and take in the natural beauty of Castle Geyser. To find reviews, other places to visit, traveler tips, and more tourist information, refer to the Yellowstone National Park trip site . Getting from Jackson Hole to Yellowstone National Park by car takes about 2 hours. Plan for little chillier temperatures traveling from Jackson Hole in August, with highs in Yellowstone National Park at 24°C and lows at 3°C. Finish up your sightseeing early on the 7th (Wed) so you can go by car to Cody. Your cultural itinerary includes sights like Heart Mountain Interpretive Center and Museum of the Plains Indian. Take a break from the city and head to Beartooth Highway and Chief Joseph Hwy. 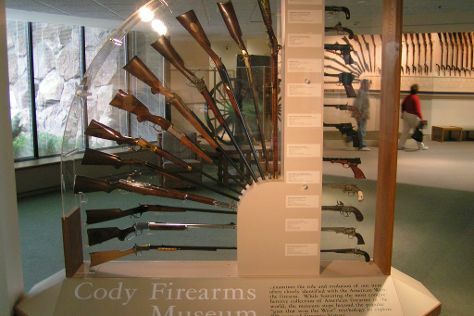 There's lots more to do: see the interesting displays at Cody Firearms Museum, admire the masterpieces at Whitney Gallery, get engrossed in the history at Buffalo Bill Center of the West, and get a new perspective on nature at Draper Natural History Museum. For maps, more things to do, photos, and tourist information, use the Cody tour builder app . You can drive from Yellowstone National Park to Cody in 2.5 hours. Plan for somewhat warmer temperatures traveling from Yellowstone National Park in August, with highs in Cody at 30°C and lows at 15°C. Cap off your sightseeing on the 10th (Sat) early enough to travel to Custer. Take a break from the city and head to Wind Cave National Park and Black Hills National Forest. Eschew the tourist crowds and head to Iron Mountain Road and Mammoth Site of Hot Springs. Get out of town with these interesting Custer side-trips: Windcross Conservancy (in Buffalo Gap) and Insideout (in Hill City). There's lots more to do: explore the activities along Sylvan Lake, cruise along Wildlife Loop Road, immerse yourself in nature at Custer State Park, and explore the striking landscape at Needles Eye Tunnel. To find ratings, reviews, where to stay, and more tourist information, go to the Custer itinerary planner . Traveling by combination of flight and taxi from Cody to Custer takes 6.5 hours. Alternatively, you can drive. August in Custer sees daily highs of 29°C and lows of 12°C at night. Cap off your sightseeing on the 14th (Wed) early enough to travel to Duluth. Situated on the westernmost point of the Lake Superior, Duluth represents a booming port city. International Wolf Center and Lake Superior Maritime Visitor Center will appeal to museum buffs. Step out of the city life by going to Onyx Beach and North American Bear Center. Explore Duluth's surroundings by going to Two Harbors (Gooseberry Falls State Park & Iona's Beach Scientific and Natural Area), Brandenburg Gallery (in Ely) and Rice Lake National Refuge (in McGregor). The adventure continues: identify plant and animal life at Congdon Park. Planning Duluth trip won't be overwheling when you use's Insprock itinerary maker. Getting from Custer to Duluth by combination of taxi and flight takes about 6 hours. Other options: do a combination of taxi, flight, and shuttle; or drive. Traveling from Custer to Duluth, you'll lose 1 hour due to the time zone difference. Expect somewhat warmer evenings in Duluth when traveling from Custer in August, with lows around 17°C. Cap off your sightseeing on the 18th (Sun) early enough to travel to Hilton Head. Eschew the tourist crowds and head to Parasailing & Paragliding and Waterskiing & Jetskiing. Get outdoors at Fishing Charters & Tours and Speed Boats Tours. Next up on the itinerary: tour the pleasant surroundings at Alder Lane Beach Access, kick back and relax at Coligny Beach, get up close to creatures of the deep with a dolphin and whale watching tour, and trek along Hilton Head Island Bike Trails. For more things to do, photos, and more tourist information, refer to the Hilton Head road trip planning site . Fly from Duluth to Hilton Head in 10 hours. Alternatively, you can do a combination of shuttle and flight; or drive. The time zone difference moving from Central Standard Time (CST) to Eastern Standard Time (EST) is 1 hour. Expect a bit warmer temperatures when traveling from Duluth in August; daily highs in Hilton Head reach 36°C and lows reach 28°C. Finish your sightseeing early on the 22nd (Thu) to allow enough time to travel back home.